Synopsis: "Grace Mae knows madness. She keeps it locked away, along with her voice, trapped deep inside a brilliant mind that cannot forget horrific family secrets. Those secrets, along with the bulge in her belly, land her in a Boston insane asylum. In this beautifully twisted historical thriller, Mindy McGinnis, acclaimed author of Not a Drop to Drink and In a Handful of Dust, explores the fine line between sanity and insanity, good and evil—and the madness that exists in all of us." 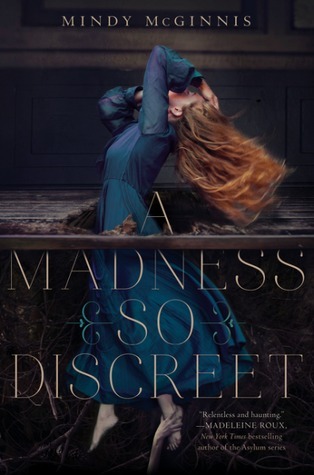 I just finished A Madness So Discreet by Mindy McGinnis. I had a hard time it putting it down once I started reading. McGinnis's writing and characters drew me in and played upon my emotions. I thoroughly enjoyed the story, liked the characters, but found myself questioning how I feel about it. Does the character's plight make her actions justifiable. How do you root for someone who takes matters into their own hand and goes against the law. But then the law wasn't doing anything for her. Is it madness or justice or revenge. Which is it? Which is why this was a truly great story. It makes you question as well as bleed for the characters.